Geophysics data overlaid on aerial photograph from 1994. The geophysical survey of Rathnadrinna suggests a linear ditch extended from the south-eastern side of the hillside, through the fort and beyond to the north-west, a total distance of c. 300 m (O’Brien et al 2009; 2010; 2011). This is a major landscape feature, perhaps a tribal boundary or an element of a hillfort, also suggested by the geophysics data. The ditch had been cut when the ringfort ditches were dug, thereby proving the boundary ditch pre-dated the ringfort. 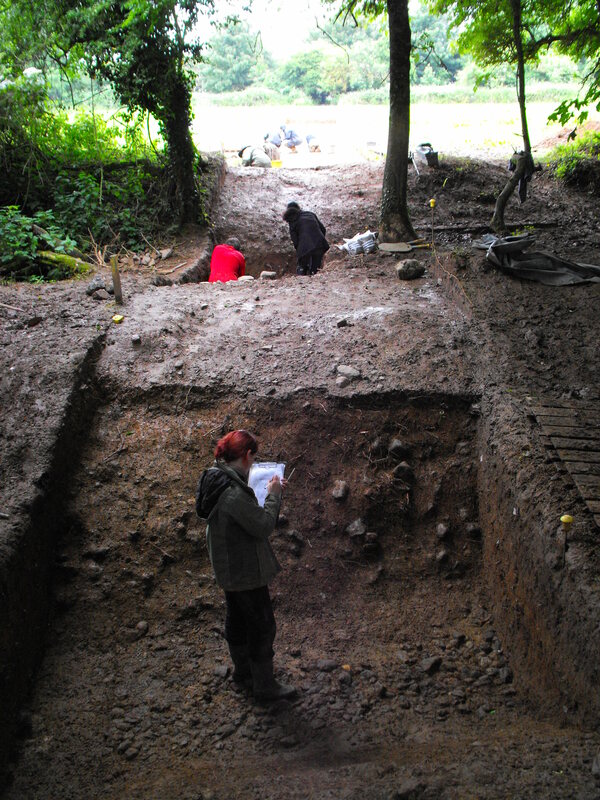 During Season One excavations in 2012 the boundary ditch, context  was investigated (O’Brien 2013). 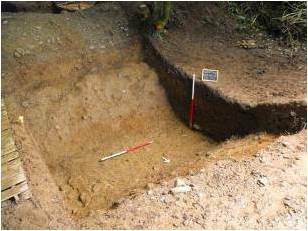 The ditch was found to be roughly V-shaped in section, and containing a number of deposits; it also had cut at least one pit. The initial deposits were stony silts with no obvious cultural material within. There appears to have been a recut of the ditch, where it narrower and was filled with a number of deposits. One of these, a charcoal-rich clay (388) was sampled for dating. Willow charcoal from (388) has been radiocarbon dated to 748–405 cal. BC (UBA-24977), the end of the Late Bronze Age/beginning of the Early Iron Age. This suggests the initial excavation of ditch  could be much earlier in date. Deposit (388) was subsequently sealed by various layers within the ditch including at least one deposit containing burnt stones. Pit was then cut into the in-filled ditch. This pit contained a number of deposits of cultural material, including deposit (57)—burnt bones, teeth, burnt stones and charcoal—although there was no obvious traces of in situ burning. Willow charcoal from deposit (57) was radiocarbon dated to 771–485 cal. BC (UBA-24975). 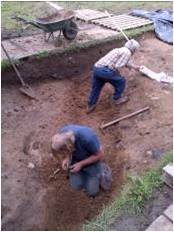 Paul & Jim excavating the pre-fort ditch  in Season One. The Late Bronze Age/Early Iron Age dates are contemporary with settlement activity in townlands to the north of Rathnadrinna like Monadreela, Boscabell, George’s-Land, Windmill and Hughes’-Lot East, excavated on the N8 Cashel Bypass. Evidence of monumental earthworks in the wider landscape is also known. To the north-east of Cashel near Littleton, excavation in Ballydavid in advance of the M8 Cullahill to Cashel Motorway identified a sub-circular enclosure—with ditch varying from V-shape to U-shape—measuring c. 125 m in diameter, and constructed in the Middle/Late Bronze Age period based on pottery evidence (Hardy, Green, & Stevens 2010, 13). A date of 835–552 cal. BC (UBA-10364) was recorded from a sample of animal bone from the basal fill of the southern ditch terminal (ibid, 47). On Rathnadrinna the pre-fort ditch then can be shown to be late prehistoric in date, at the latest. 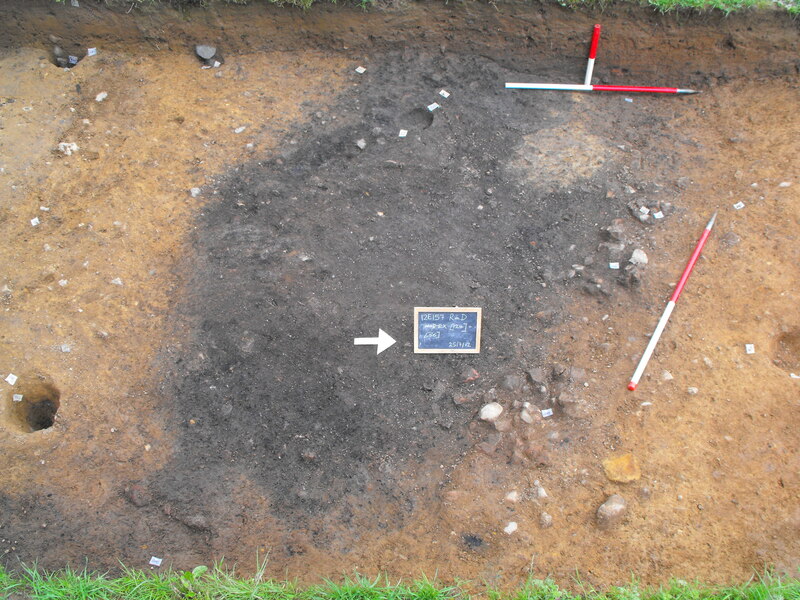 As excavation has shown the ditch had truncated at least one pit, and was itself cut by another pit, the evidence further confirms the multi-phased nature of the archaeological remains on the hillside. This was reinforced again with the recovery of an chert arrowhead from Season Two 2013 stylistically dated to the Early Bronze Age period. A cereal-drying kiln was discovered outside the southern fort bank and investigated in Season One (O’Brien 2013). The stone-built kiln only survived to its lowermost three courses and a portion of the flue was revealed, the remainder extending eastward beyond the baulk. A metalled stone area to one side of the kiln may have been a working surface. The kiln did not produce any obvious in situ burnt grains, however a basal clay fill (68) of the flue contained charcoal. This was sealed by the main deposit (08) within the kiln, from which an unidentified ferrous object was retrieved. Carbonised oat from deposit (68) was radiocarbon dated to cal. AD 777–980 (UBA-24976). Similar stone-lined kilns found east of Cashel in Hughes’-Lot East were dated between the 7th–11th centuries AD. These kilns, excavated on the N8 Cashel Bypass in 2003 were found outside an univallate (Site 25iv) and bivallate (Site 25ii) enclosure respectively. Rowan & James doing the Magnetic Susceptibility survey over the kiln. 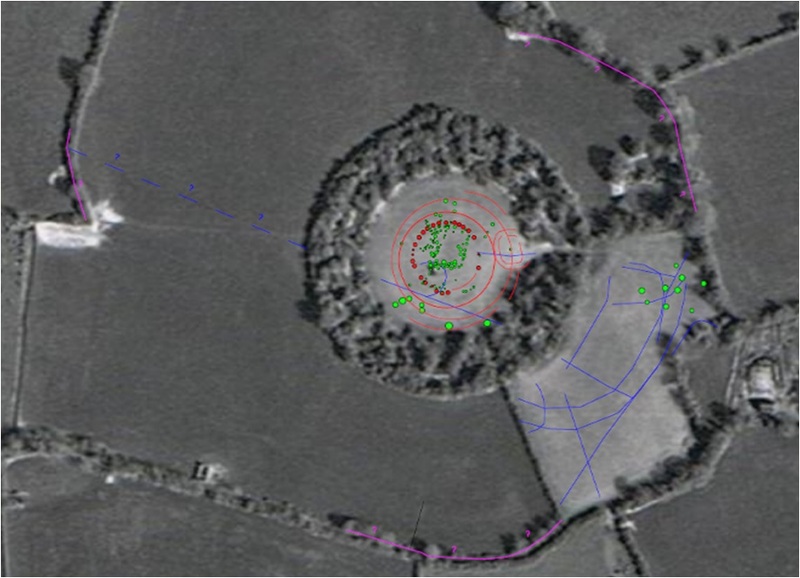 On Rathnadrinna each of the ringfort ditches was investigated in Season One (O’Brien 2013). The central ringfort ditch (Ditch C),  was initially filled with a silt layer (72), sealed by a layer of compacted stones (62); sealed by a deep clay deposit with occasional stones (51); sealed by an orange-coloured clay (29)—probably bank material—sealed by the uppermost deposit of clay/humic material, (17). A fragment of burnt bone was retrieved from deposit (51). 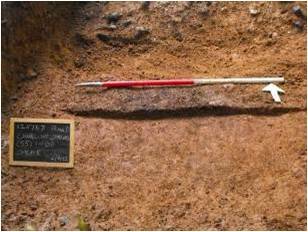 A localised lens of charcoal-rich clay (55) found within deposit (51) produced hazel nutshell, radiocarbon dated to cal. AD 890–991 (UBA-24974). This activity was contemporary with the cereal-drying kiln found outside the fort, and contemporary with the occupation at both Hughes’-Lot East forts. The date was also broadly contemporary with the ex situ stud mount—provisionally dated to around the 8th century AD—found last year. 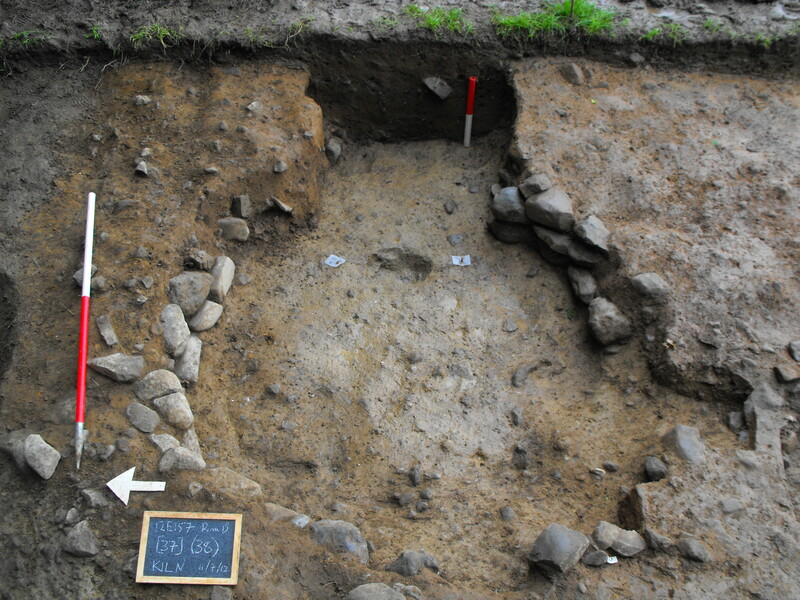 This dating evidence shows late Éoganachta-era activity at Rathnadrinna fort, while further dates from the ditches will be required to determine the construction sequence of the ringfort, and any relationship this had with the earlier activity. 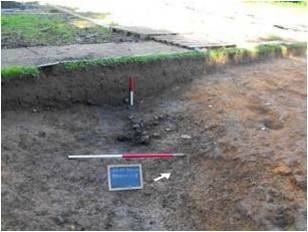 I would like to thank the Royal Irish Academy Archaeology Committee for approving the Rathnadrinna C14 submission in 2013, and for funding the excavation. 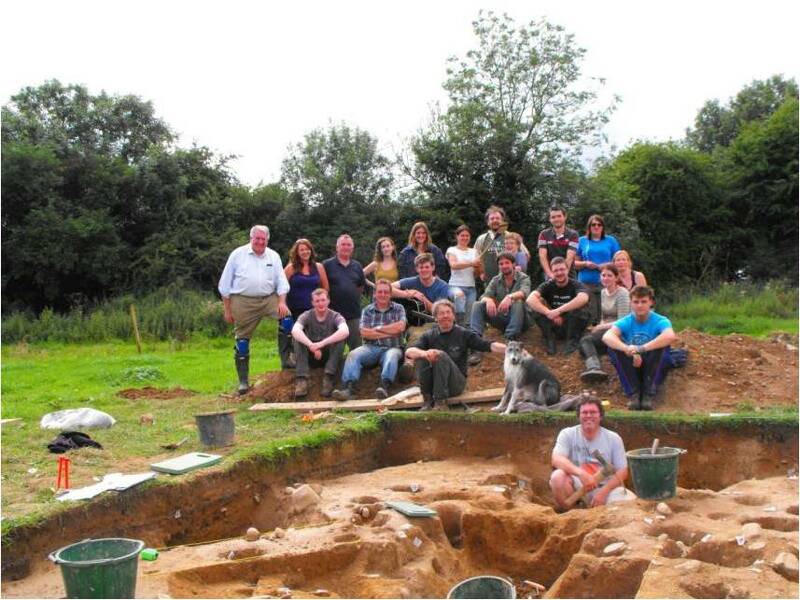 Some of the Season Two excavation team in August 2013. Hardy, C., Green, B. & Stevens, P. 2010 M8/N8 Cullahill to Cashel Road Improvement Scheme: Archaeological Resolution Final Report A027/000 E2370 Site AR 26, Ballydavid Townland, Co. Tipperary. Unpublished Client Report by Valerie J. Keeley Ltd for Kilkenny County Council. 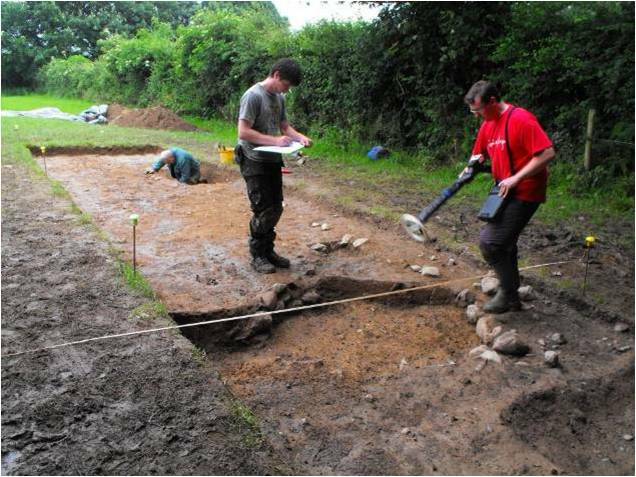 O’Brien, R. 2013 Stratigraphic Report on Season One Excavation at Rathnadrinna Fort, Lalor’s-Lot, Co. Tipperary. Unpublished Report for Royal Irish Academy. O’Brien, R., Gimson, H. & Bonsall, J. 2011 ‘Revealing royal Rathnadrinna’, Current Archaeology, 26–33. Issue 259. Selkirk Publishing, London.